Unfortunately if you do the calculation I'm in my 70's. The good news is that I've got some life experiences behind me. The bad news is I can't dance all night. 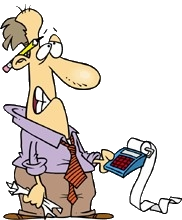 I have been providing small business consulting and bookkeeping in the Knoxville area for over 20 years. I cater to small businesses that are unable to afford the luxury and cost of a full-time professional staff member or need some additional outside help. Graduated in 1968 With Honors from the University Of Tennessee with a B.S. in Accounting.